All month long we are showing love to small and local businesses by featuring them on our blog! We are doing this because November is the month of gratitude, and we’re thankful for small businesses. Along with putting the spotlight on an awesome business, we also hope to inspire other business owners (or aspiring business owners) through the answers of those we interview. 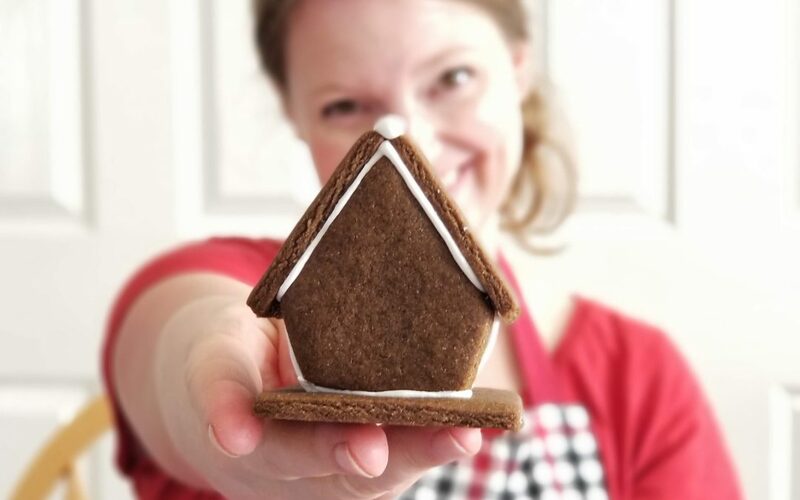 I design, bake and assemble miniature gingerbread house kits. 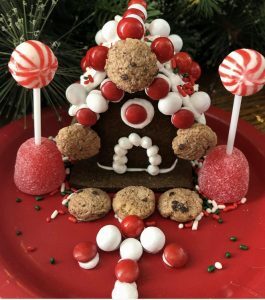 A family can order a tiny cookie house for each person and have everything they need to sit down together all at once and create a gingerbread village. All they need is a pair of scissors to cut the icing! And it’s not just houses. This year I’ve got ten choices including the Elves’ Music Hall, Blitzen’s Breakfast Barn, and Santa’s Last Stop Cookie Shop which is a bakery that made it big when Santa started stopping there on his way out of town. I take cookies and candy and give them a character with a compelling backstory. What sets you apart from others like you in your community? My kids all have certain jobs and I’ve hired a few other family members when I get in a bind, but for the most part I’m on my own! Where can your business be found online? I am on Facebook and Instagram. How do you connect with past and future customers? I am so lucky because I get to meet most of my customers in person when I hand deliver their orders. Mine is the smallest of small businesses. When we first started, my husband calculated about 3 minutes per delivery but he says as I get to know each repeat customer better he’s had to bump that up to 5 minutes. What’s your favorite thing about owning a business? My absolute favorite thing about owning a business is the people I meet that I would never have met otherwise. And I love having something that has become an extension of me. It’s creating, writing, baking, and people. All things I love. And I get to work alongside my family which is something I’ve always wanted to do. We have a “Gingerbread after Midnight” playlist that keeps us going. What’s the hardest thing about owning a business? Baking is physically exhausting! That first Christmas season, I had to change up my rolling pin, take stretching breaks, wear specific shoes…. the first thing I did after Christmas was schedule a massage. Baking is the one element I never delegate. I don’t trust anyone else to do it like I would! I had an idea and I couldn’t stop thinking about it. I told a friend and she didn’t think it was dumb… that gave me the courage to make it a reality. What advice would you give someone looking to start up their own business? When I was starting out I got totally stuck on choosing a name. I googled how to choose a name and the advice I got was to just pick one. I’m not sure if my name is perfect, by any means, but it was good enough to get me started. If choosing a name is the only barrier then I say just pick something and jump in! The other advice I would give to someone in a business like mine is to be ok with selling out of something. I was trying so hard to please everyone my first season I never limited quantities and totally burned out trying to keep up. What is your secret sauce for success? I think it’s really important to pay attention to how customers are using my product. 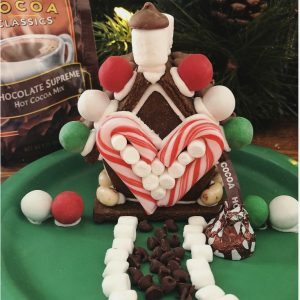 I make these gingerbread kits so when people post them all decorated I get a chance to critique my work. The first thing I noticed is they were using just whatever paper plates they had on hand. So it’s an adorable Christmas gingerbread house sitting on a power rangers plate. I realized most people don’t just have themed plates on hand to match 12 different gingerbread houses so I started including them with every house. I love finding ways to improve every season, and that comes from listening. At Halloween everyone asked for all the fun stories I’d written to go with every house. So for Christmas I’m printing a full color North Pole Directory. If things stayed the same all the time I would be incredibly bored! Thank you, Emily, for taking the time to answer questions for us about your business. And thank you for helping us to get in the holiday spirit around here! If you’re just as inspired by Emily as we are, be sure to check out more pictures of her work, and follow along as her business grows. Emily’s houses are amazing and Delicious! My kids look forward to every holiday to see if they get to make a new house. 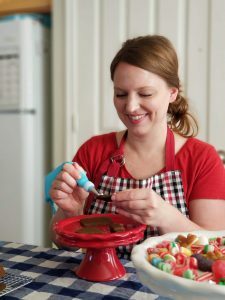 This such a fun way to bring holiday cheer to your home.